DESCRIPTION: PCI provided design services for the original installation of this project. This phase of the project replaces the existing 400kVA UPS rectifier module with new, and also makes provisions for a temporary roll-up generator so that the fixed-in-place generator can be placed through yearly servicing. 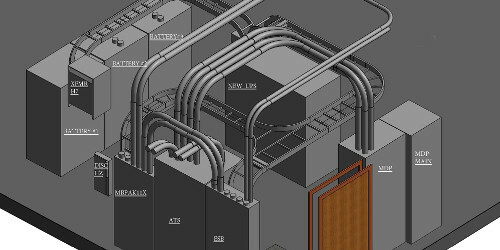 In an effort to minimize UPS downtime and minimize time on the temporary roll-up generator, PCI, utilizing BIM modeling, provided a 3D phasing plan to demonstrate constructability of various installation options. Since the electrical contractor needed to work on energized equipment, PCI provided an Arc Flash Hazard Analysis (AFHA) for all affected equipment.